The OB Joyful houseboat can probably be classed as semi-luxurious houseboat, the sleeping cabins and enclosed living areas are nicely finished off in wood panelling and they are all air-conditioned but it doesn't have the luxuriously furnished saloons of the Catalina or Lady Jacqueline. 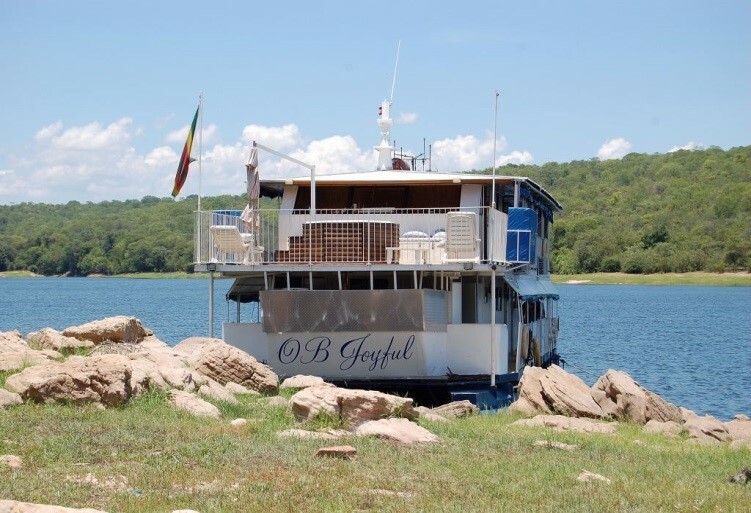 The OB Joyful is a traditional "pontoon" Kariba houseboat which makes travelling a bit slower, but the advantage is the wide-open decks and plenty of space to relax and enjoy bird and game viewing, as well as the scenery. 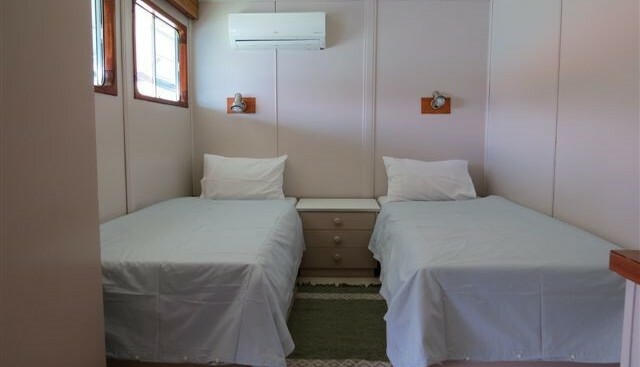 The OB Joyful is able to sleep 8 people in air-conditioned cabins which is it's advantage over The Abangane - that is, if you want to sleep in cabins. 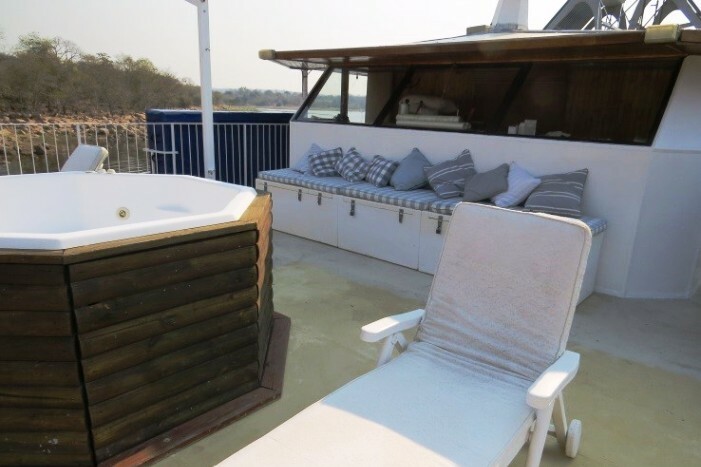 It's a really nice houseboat at an affordable price and is mostly hired out on a self-catering basis, but a fully catered service can be arrange through an outsourced company. 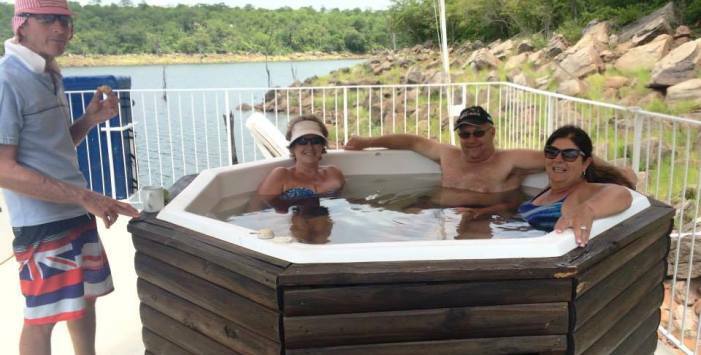 The OB Joyful Houseboat is fully serviced with a crew of four to take care of your every need. 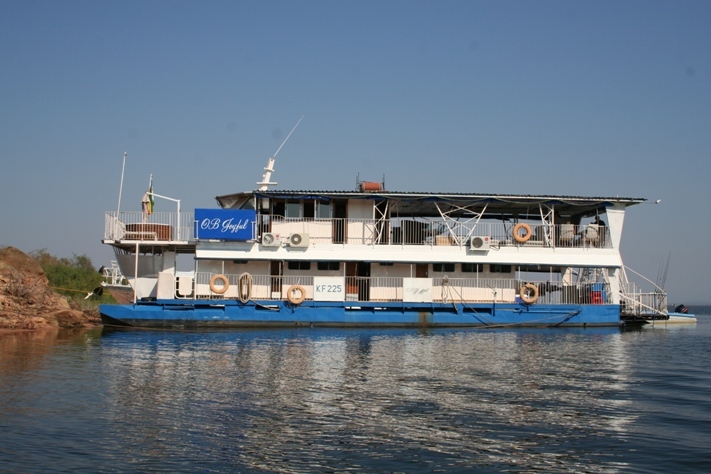 The crew consists of a captain who has an excellent reputation on Kariba, a chef, a deck hand and a cabin attendant. The OB Joyful undergoes ongoing extensive maintenance and upgrading to pontoons, generators, main motors, propellers, rudders and gearboxes. New air-conditioners have been installed. New linen has been supplied. Current seaworthy certificate. 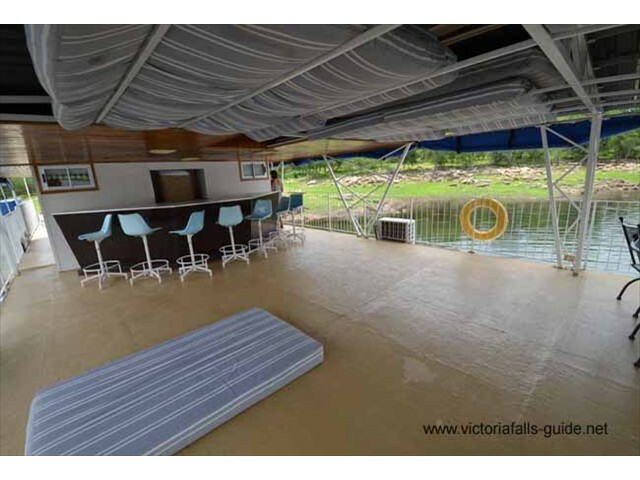 This boat is a pretty nice one and the price is great for self-catering, and if you want to go hassle-free, catering can be outsourced for you. Remember that the air conditioners only run when the generators are on, and the generator is turned off at 10pm as per lake regulations. • Licensed to carry 23 persons inclusive of 4 crew members. However, no more than 14 passengers (excluding crew) are recommended for comfort. mosquito nets for those wanting to sleep in the open. • Braais - Wood/Charcoal braai on board that will be taken onto shore when needed. Charcoal to be supplied by client unless on a catered charter. 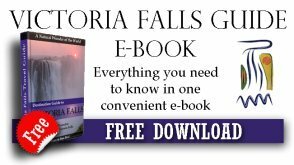 • Laundry - Washing and Ironing of clothes can be done at $5 per load which is payable to the Chef before washing is done. Washing powder, soap and fabric softener to be supplied by Client. 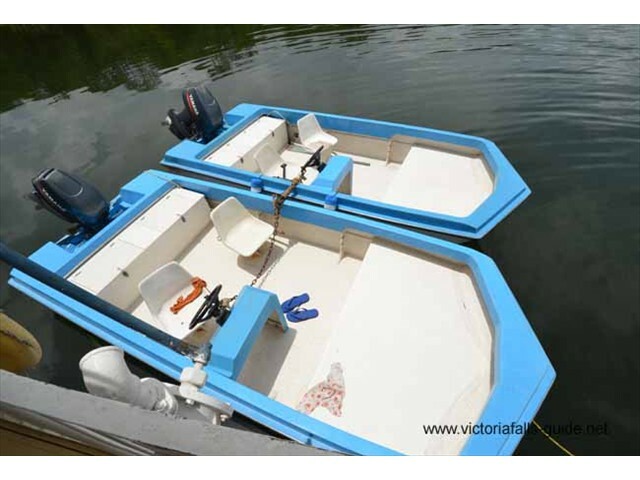 • Tender Boats: 3 Tenders, 2 x speed boats and 1 x Pontoon (There is a 4th tender available at $80 per day which does include its own driver). Self catering cost of charter is US$ 475 (low season) / US$ 556 (April except Easter, August, October, 1 to 22 December) / US$ 663 (Easter, 23 to 31 December) per night. •	A deposit of 50% is required before booking can be confirmed and is required within 21 days of provisional booking. The remaining 50% is due 7 days before clients board OB Joyful houseboat. • Refund Policy: - 25% non-refundable in cash. However, this will be held for a further booking from the same client within a 12 month period. - 50% non-refundable if booking cancelled 7 days or less prior to boarding - 75% non-refundable if booking cancelled 48 hours or less prior to boarding.